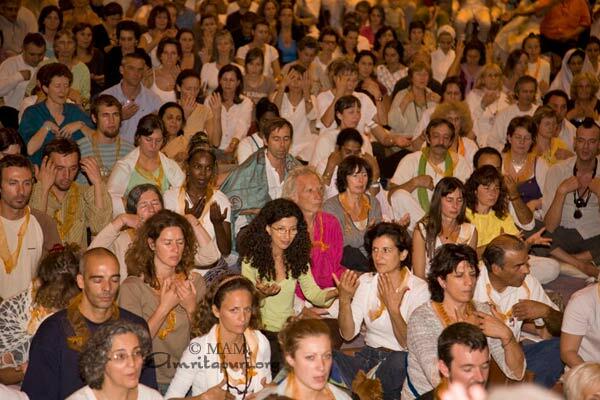 GreenFriends France taken up a reforestation project to make the French Ashram a place where devotees and visitors can get in touch with nature and develop a deep sense of unity with. The reforesting of the property is one of the steps which will help bring about this new perception. A small forest full of tree species coming from all over world is planned and will be a symbol of Amma’s universal message. In addition, there will be an apple orchard which also will provide shade for the visitors parking lot. 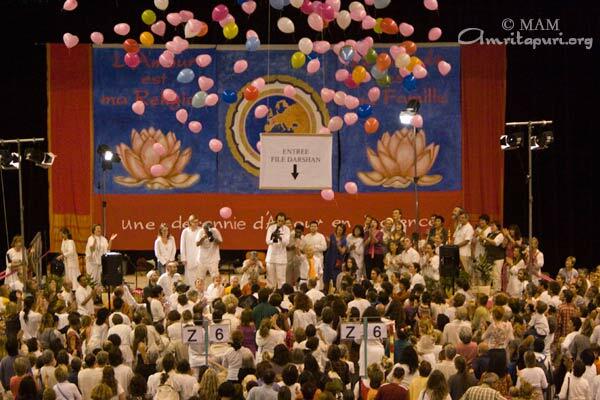 All this was accomplished this year by asking those devotees who came to see Amma in Toulon and Paris to adopt around 50 trees each. The adoptors of the trees have been invited to become more involved by planting their trees themselves this winter during two GreenFriends week-ends devoted for this activity. AYUDH group in UK while celebrating their 1st anniversary, started a garden project as part of GreenFriends in an effort to grow fruits in their own private gardens. This project is an effort to raise awareness that one need to produce one’s own food and a little extra for others too. 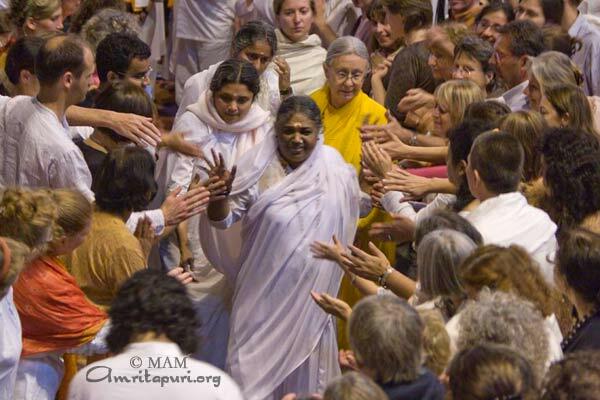 The AYUDH in UK carried a pear tree up to Amma for blessing, which would be planted as part of the garden project, and a pot of seeds, which would be used for the proposed tree-planting project. Location of the 1998 Winter Olympics, Nagano is a mountainous area that receives large amounts (over 3m!) of snow each winter. 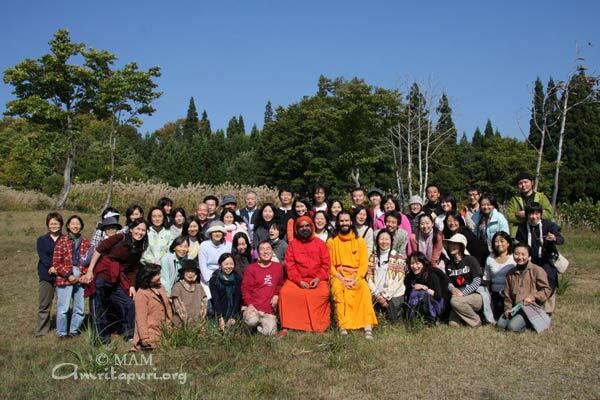 This idyllic rural location became the backdrop for this year’s Japan retreat, with Swami Purnamritananda held at the Beech Meadows in the Nabekura Highlands. Despite the remoteness of the location, the retreat was full – even overbooked. The retreat began with a preliminary program for the children, where Swami Purnamritananda taught them how to play the bamboo flute, and each child received his/her own flute (from India) to take home! Meanwhile, the adults went on a nature walk with Br. Shantamrita, stopping in the middle of the beech forest for meditation. 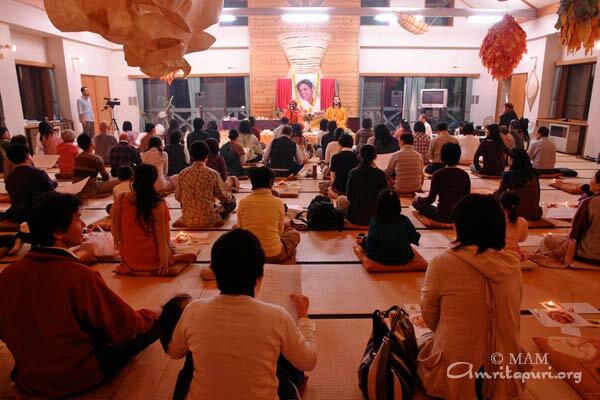 Atma Puja was performed on the first evening of the retreat. 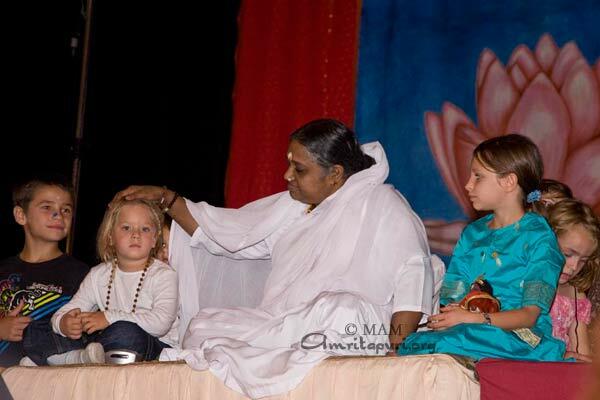 Swamiji guided the retreatants through the steps of the ceremony, where they meditated and offered flower petals to Amma’s Yantra while Swamiji led Amma’s 108 names. The following morning began with Mahaganapati Homa at sunrise, held in a peaceful grass field surrounded by forest, pampa grass, and a gurgling brook. Everyone commented on how ideal the surroundings were for the ceremony – one could imagine that such places might have been used by the ancient sages, as well. 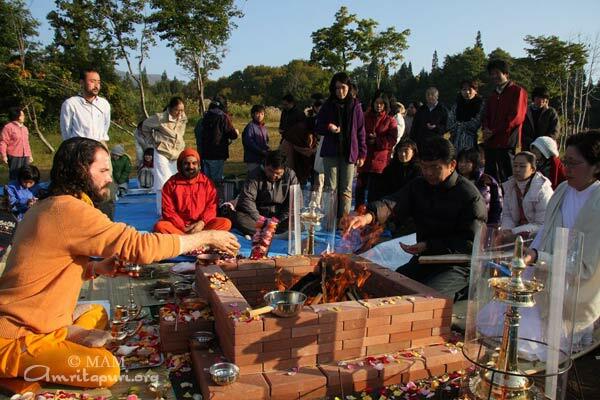 The homa was followed by walking meditation, and eco-meditation in the beech forest. After lunch, the participants reconvened in the main hall for a Q&A session with Swamiji, followed by a meditation class. 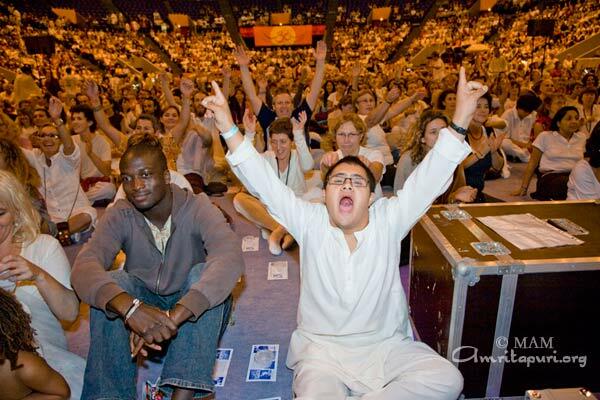 At the conclusion of the retreat on the second night, many people were shedding tears, and had to force themselves to go home, in order to attend work the following morning. The first Nagano Retreat was a grand success, and the unanimous feedback was to hold next year’s retreat in the same location – but this time add an additional day! Swami Purnamritananda Puri arrived in Kobe, Japan on the morning of October 11th conducting the first program of his month long tour in Japan this year at Sanda Satonone Hall. The program began with an introductory video about Amma’s Tsunami Relief work and the Japanese Student Volunteers who participate in the housing project every year. A famous Japanese opera singer made a musical offering to Amma, by singing the song “Amazing Grace,” which set the tone for Swami’s program to begin. 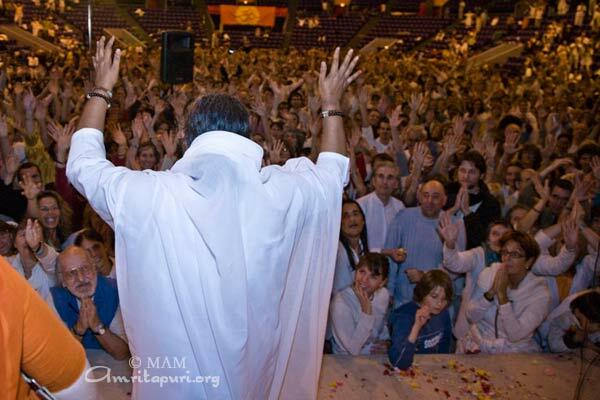 Swami began with an eloquent satsang on the present state of affairs in the world, and how we can restore the lost balance of nature, the economy, society, and humanity as a whole, by learning from Amma’s example of selfless living. The over 400 attendees all listened with rapt attention. 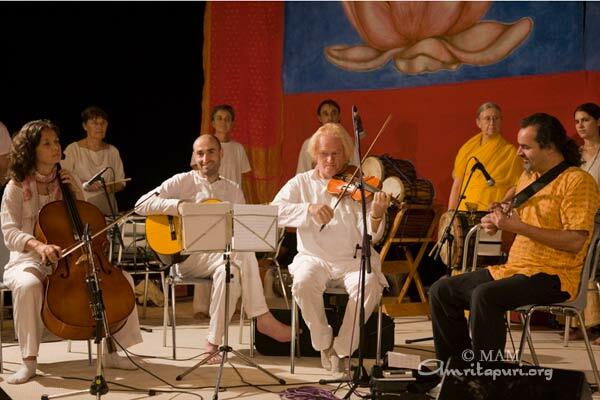 The hall was then filled with the peaceful strains of Swami’s devotional singing, including a new Japanese translation of his own bhajan, ‘Azhikkullil’. 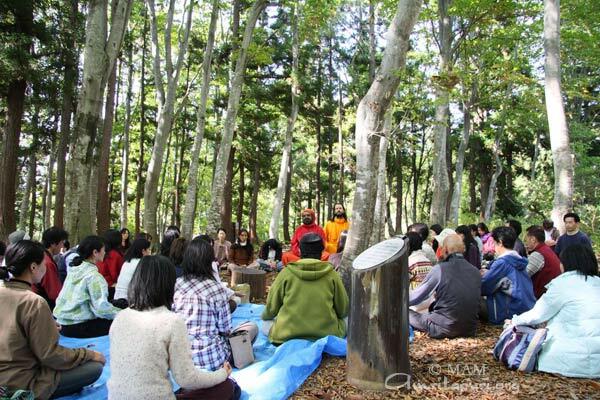 After the bhajans, the Japanese devotees were instructed to meditate on the sound of the bamboo flute, guiding everyone through a musical meditation. 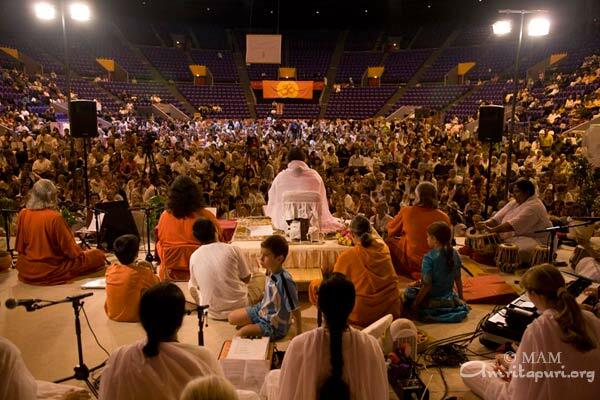 Swami also answered their spiritual questions before the program was concluded with prasad distribution to one and all. At the end of the tour, Swamiji and Br. 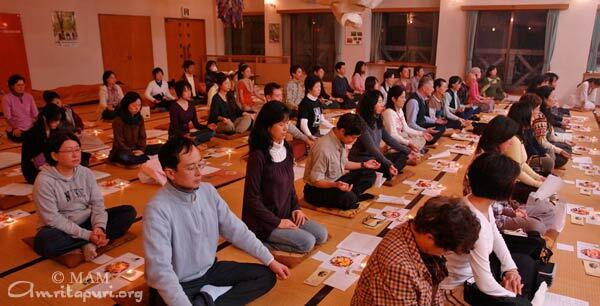 Shantamrita will return to Kobe again for an IAM Meditation technique course. 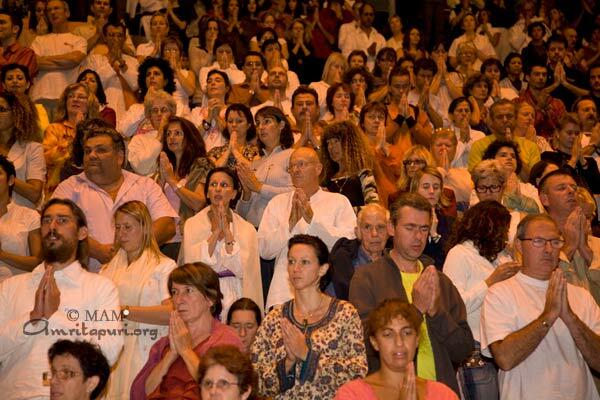 With the humongous crowds Amma’s Paris programs this year were a literal celebration for the French devotees. 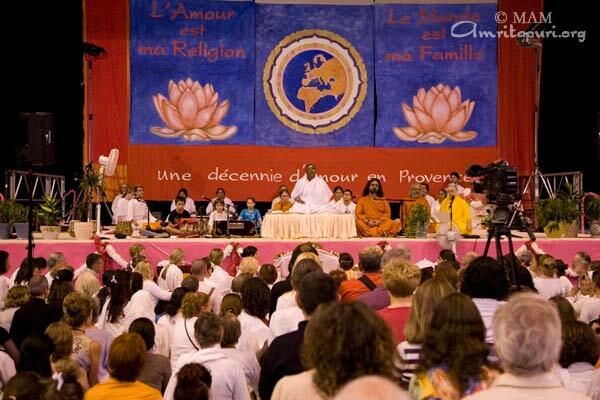 Amma hit the headlines of almost all the media giants of the country such as “France 3”, “Cap 24”, “LCI” “Canal+,” “Le Parisien”, “Direct Matin”, “20 Minutes”, “RTL Radio” and “France Inter”. In addition to this, the International press agency, “Reuters” and “AFP” the French press agency were also present. 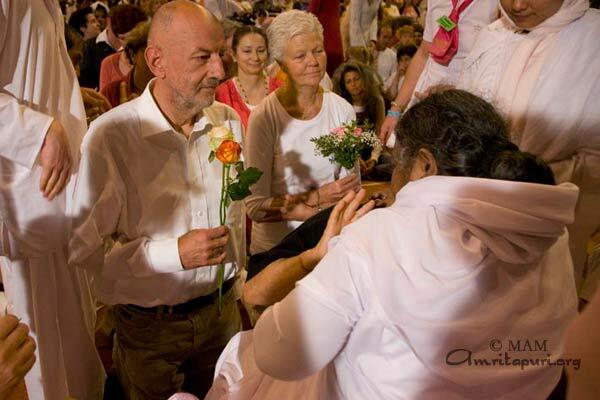 Jan Kounen, a renowned French Filmmaker, comes every year to see Amma. He said: “I feel rejuvenated after meeting Amma. She gives me tremendous energy through her darshan, which helps me remain focused and also adds value to my work and life”. the devotees find it extremely difficult to let her go. 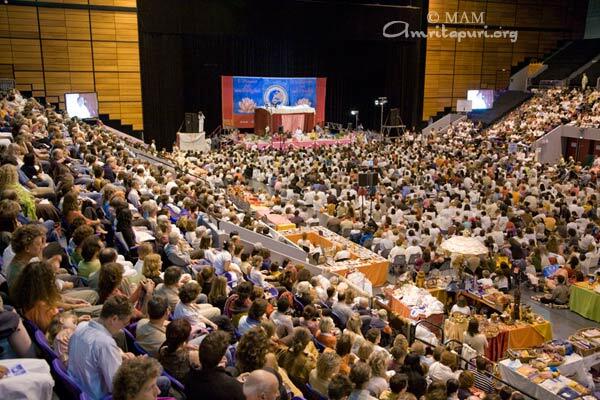 The City of Winterthur in Switzerland is the beautiful setting for Amma’s program for the 4th year in a row. 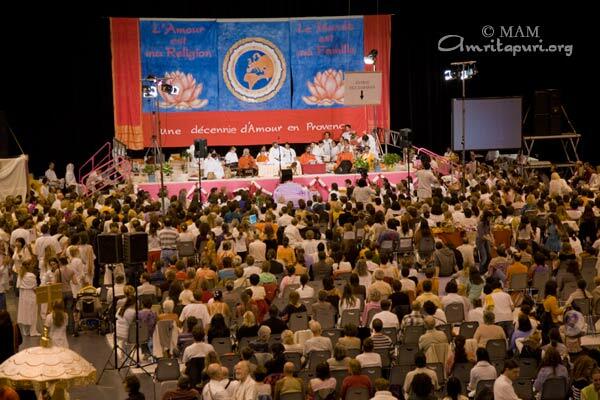 For this joyful yearly occasion people from neighbouring countries like Germany, Italy and France took the opportunity to be in Amma’s presence also amongst the thousands of Swiss devotees. ‘Omega Zenith’ which is a national monument and like every year large number of people came to meet Amma and stood in line for hours to receive Her darshan. 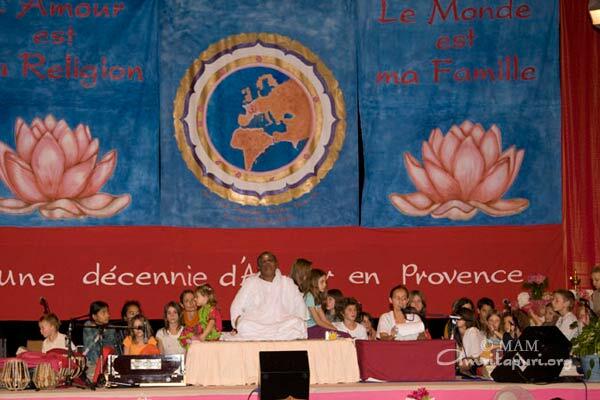 This year’s program in Toulon marked the 10th anniversary of Amma’s visit to the Provence in the South of France. 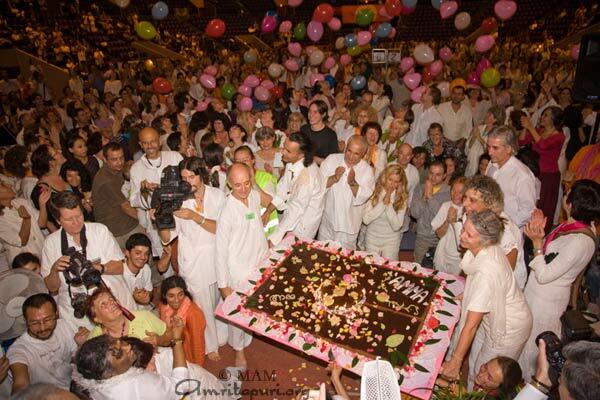 To celebrate this, they presented Amma an enormous festive chocolate cake and dropped colourful balloons from the top of the hall. Members of the government approached Amma for advice regarding the inner psychological state of members of the Indian paramilitary forces. 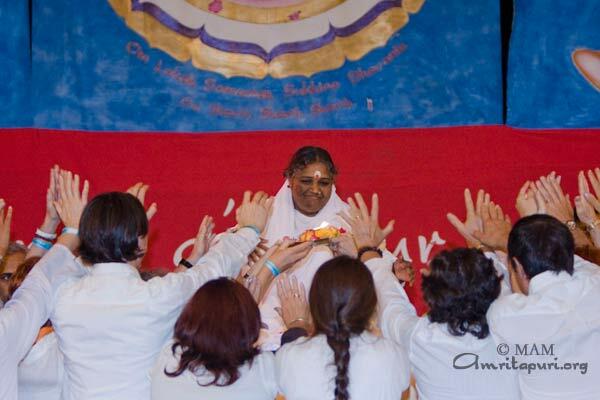 Amma decided to reach out to them through providing IAM Technique classes for the entire forces of the country – 2.5 million strong. The original IAM Techinque was modified to suit them and enable them to reduce the stress levels. A presentation was made to the government officials with an offer to teach it free of charge. Once they were convinced of its effectiveness the project was commenced in July 2007. A group of 30 brahmacharis formed 10 teams and spread out in all directions. The project should be concluded around the end of 2009 reaching the targeted 2.5 million military personnel. 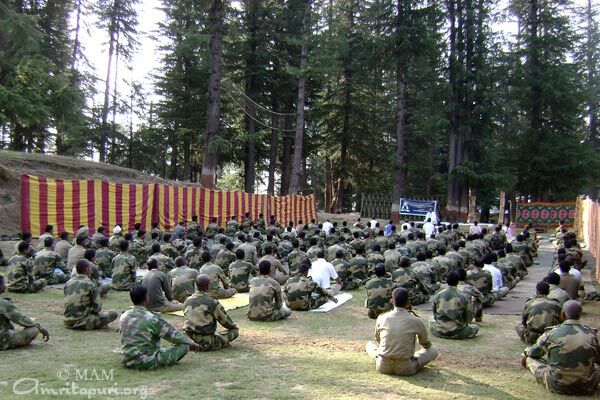 At the end of September 2008, 180 3-day camps had been held, benefiting about 800,000 personnel. The brahmacharis teachers teams have also properly trained a select group of trainees from among the force personnel have been selected who will be teaching the course to others and also conducting IAM sessions in their respective units. Realizing the effectiveness of the technique in reducing stress levels – the forces have decided to incorporate this technique in their regular schedule. They also have to send quarterly reports to the Home Ministry detailing how they have been implementing this technique in their respective units. 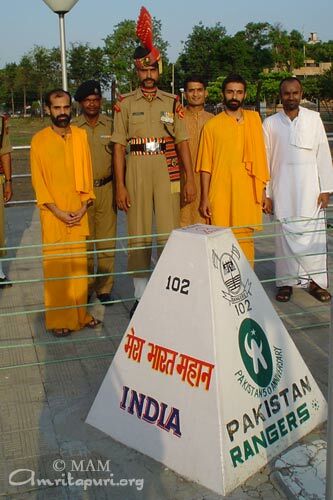 – Border Security Force (BSF) – some of the most inhospitable terrain is manned by the BSF including the extremely sensitive borders with Pakistan and Bangladesh. – Indo Tibetan Border Police (ITBP) – The high altitude Himalayan mountain police force of the country. They patrol areas with elevations between 9000’ – 18000’ along the 3500 km long Indo China border. Also engaged in VIP security and guarding Indian missions in war torn countries like Afghanistan. – Sashastra Seema Bal (SSB) – Guarding the borders with Nepal and Bhutan. Have been assigned the added duty of fighting naxal terrorism. – Central Industrial security Force (CISF) – Protect all the sensitive industrial installations, ports, airports etc. Have the added responsibility of VIP security. – Central Reserve Police Force (CRPF) – The largest paramilitary force in the world with a strength of 200 000 strong personnel. Entrusted with counter insurgency operations in J&K, North East and left wing terrorism infested areas apart from UN operations in Lebanon, Sierra Leone. 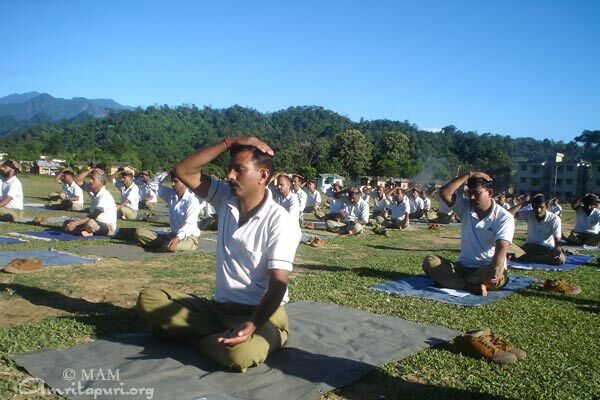 Pilot classes have also been taught to soldiers of the common Indian Army and Navy. 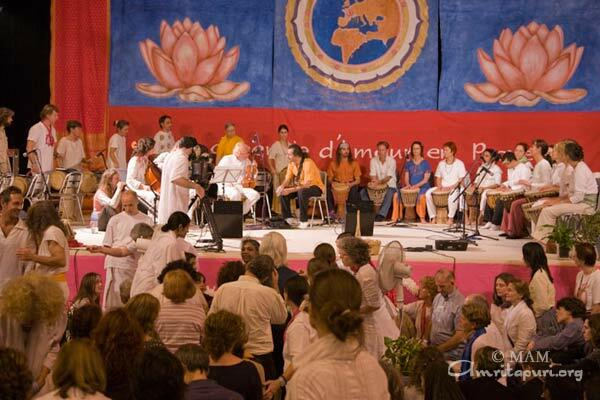 The German Ashram, about one hour from the Frankfurt Airport. 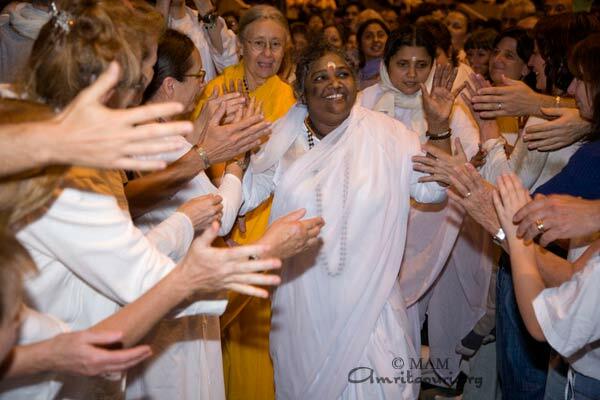 Amma went around the ashram which is surrounded by beautiful hills, apple trees and has several horses. 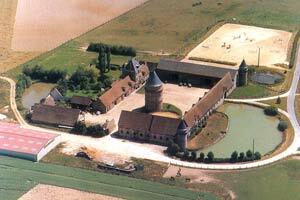 Amma went to the stables to feed and softly caress all the horses there. 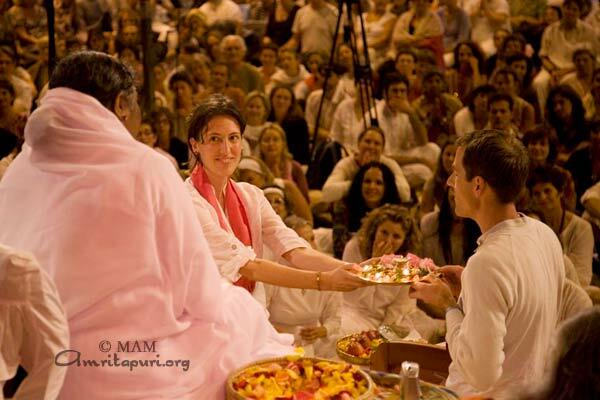 Amma gave prasad to devotees who were all waiting at the Ashram on her arrival. The Public Program is held in the “Europe Hall” in the city of Karlsruhe. 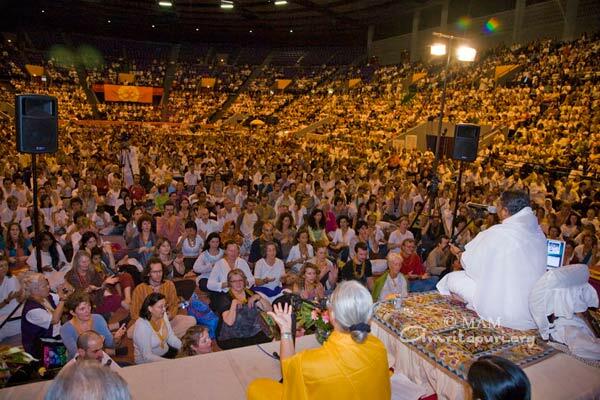 Thousands of devotees waited in line to receive Amma’s darshan during the three day program.